The time will come when your household hot water heater needs to be replaced or repaired. In the past it was a simple choice, just replace your current storage tank water heater with another model that was exactly the same. Now there are plenty of other choices on the market. You’ll want the right size (gallons) hot water heater with the best recovery rate for your family’s needs. It should deliver hot water when and where you need it in the most energy efficient and cost conscious manner. Never spend more than half the cost of replacing your hot water heater in repairs. If the repair bill gets too high, please contact Streamline Plumbing for a Free 2nd opinion on replacing or repairing your water heater. Conventional storage gas water heater, the most common in American homes, Electric-powered storage water heater, tankless water heaters, Solar water heater fuel for gas hot water heaters is either natural gas, propane or oil-fired. Gas models have a reservoir or tank holding from 20 to 80 gallons of water. When you turn on your hot water tap, hot water comes to you from the top of the tank. Cold water to be heated enters the bottom of the tank, so the tank is always full unless supply has been exhausted. While electric water heaters have storage tanks and provide hot water in much the same way as do gas ones, they heat water using two electric elements, each with its own thermostat. 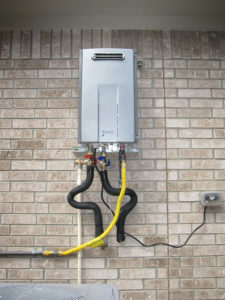 A tankless water heater costs substantially more than either gas or electric. Yet, their efficiency advantage is obvious; they provide hot water only as needed so there is no storage tank and no standby heat loss. Some brands promise up to 40% energy savings. Since there is no tank, the space saving feature is huge. Multiple hot water demands at the same time may tax a tankless water heater, and in these situations more than one unit is optimum. A solar water heater includes a storage tank and solar collector. They are powered using free energy from the sun. Systems installed in higher latitudes may require additional design requirements that will add to the complexity and cost of the system. Water heater prices vary for a wide range of reasons, including the water line connections, valves, venting, gas line, strapping, access, and type of water heater. Contacting a professional plumber for a free in-person evaluation of your particular situation is the best way to check pricing. A “blind” quote over the phone is often inaccurate. Choosing a new water heater can become a hassle. Refer to the warranty to assist you. Five, ten and seven year warranties are the most common. The life of a storage tank water heater is dependent on the tank itself. A tank that is built better is usually going to cost a bit more and have a longer life. Spending a little extra up front will give you a more efficient water heater, which will save you money in the long run. For both tankless and solar water heating systems, the larger initial financial outlay may discourage many people from these options, even though long-term savings are substantial. Although both gas and electric water heaters lose some of their efficiency because water is constantly being heated in the tank, their efficiency is much improved over the past. Both gas and electric storage water heaters, if heavily insulated, significantly reduce heat loss and have a thermal resistance. Overall, high efficiency hot water heaters will use 10 to 50 percent less energy than older standard equipment. Look for units with the Energy Star® symbol to further enhance the green living standard of your home. To keep your traditional storage hot water heater in tiptop operating condition, you should have it flushed and inspected annually by a qualified plumbing contractor. Contact us for information and assistance regarding water heater maintenance or selection of a new hot water heater, including a tankless water heater and a solar water heater. Fast and affordable pricing for repairs.